Netflix (NFLX) will report their Q4 results tonight after the close. The implied one day move is about $29, or about 8%. That can be determined by taking the at the money straddle in the weekly expiration (the call premium + the put premium) and dividing by the stock price. 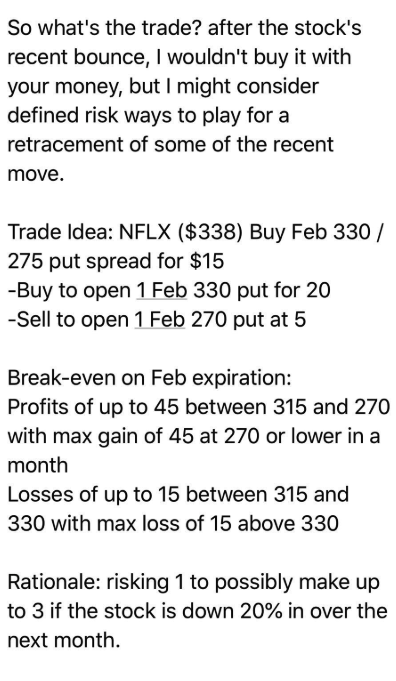 In this case, the Jan 18th (tomorrow expiration put and call) with the stock near $352.50 are each offered at about $14.50 if you bought that, and thus the implied one day move then you would need a rally above $381.50 or a decline below $323.50 to make money. Profits of up to $40 between 290 and 250 with max gain of $40 at 250 or lower. Losses of up to $10 between 290 and 300 with max loss of $10 at 300 or higher. Rationale: this trade idea risks 3% of the stock price for a break-even down 7.5% on next Friday’s close following earnings. But this trade idea is really a defined risk bet between now and earnings that the stock will retrace some of its recent move and the profits for the pre-earnings decline will assist in financing a roll of another spread that will merely isolate the earnings event. 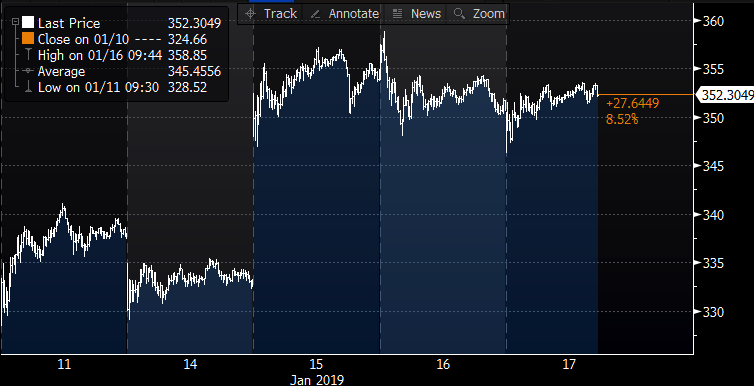 With the stock near $352.50, up about $15 from Friday’s close the trade is worth about $11, the issue with the trade now is that the break-even down at $315 is nearly 11% lower than current levels. Despite having one month to get back there, the odds are not exactly great at this point. The options market is saying there is about a 22% chance that the stock will be at $315 on Feb 15th expiration. At this point, given my recent track record in trying to pick a top on NFLF this month alone, I am right to be a bit cautious, and the idea of throwing good money after bad is at top of mind. I would also add that the company announcing this price increase days before they give results and guidance is likely to be viewed as a sign of strength. Profits of up to 35 between 335 and 300 with max gain of 35 at 300 or lower. Rationale: this trade idea risks 4% of the stock price for a break-even down 5%. This after the stock has rallied more than 50% since Christmas and is up a whopping 32% on the year.